There’s a lot more to Revenge than isolated stories of oddballs and psychopaths though – as soon as the reader moves on to the second story (‘Fruit Juice’), they realise that Ogawa has a slightly more complex idea in hand. You see, each of the stories takes something from the previous one and runs with it, with minor characters suddenly appearing in the spotlight, their actions now centre stage. Even better, the deeper we get into Ogawa’s world, the more tangled the web of connections becomes, with people and objects harking back to several earlier stories. By the time we get to the last of the eleven tales, ‘Poison Plants’, it’s no surprise that the central character leads us back to the start of the book, completing a circle. Oh, yes. This is easily the most impressive of the books I’ve read since the longlist announcement, one I devoured in a matter of hours (having started it about half an hour after it dropped through my letter box!). It’s a superb book, well written, with an excellent translation (I’m a big fan of Snyder), and another piece of what should become an impressive Ogawa legacy in English – with over twenty books published in Japan, we have a lot of treats yet to come. Just one thing puzzles me, though – how on earth did The Housekeeper and the Professor get translated before this?! So glad you liked it as much as I did, I really admire her talent for story telling and creating such intriguing characters, they seem to arrive effortlessly one after the other, with their little idiosyncrasies and penchant for revenge 🙂 Delicious stories indeed. Interesting about The Housekeeper, I had read The Diving Pool and so found The Housekeeper and the Professor quite a departure, but I think the novella has a wide general appeal, which is good for getting a translated author established, I know bookclubs picked it up too and lets face it, many people do have that thing against picking up a short story collection, not liking to be severed from their characters too soon, so in Revenge, she manages to keep the threads that will appeal to those who prefer the novel. 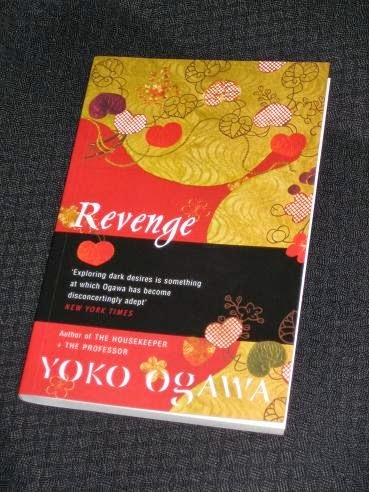 While the title of Revenge coming from Ogawa disturbs me enough (after meeting her sinister characters in The Diving Pool) the interconnectedness you describe does sound very clever and certainly piques my interest – great review. I love that this collection is finding its proper audience, and Snyder is such a good translator, but I mourn the loss of its actual title. “Revenge” is so generic and sorta puzzling (it's not really about revenge….? ), and the original title is so amazing: 寡黙な死骸 みだらな弔い, or: _Reticent Corpse, Indecent Burial_.